At left, the late Freddie Munnings, Sr., one of Nassau's leading musician/composers, bandleaders, and entrepreneurs. 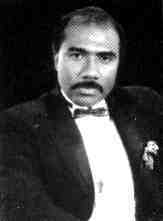 He was the owner of the famed Cat and Fiddle Club, a venue where top Black artists from around the world came to entertain in the 50's and 60's. 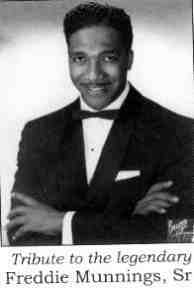 Among such artists were Nat King Cole, Dinah Washington, Harry Belafonte, Paul Anka, Count Basie, and Roy Hamilton. The club also featured talented artists from Spain, Mexico, and the Caribbean. The Cat and Fiddle was definitely the place to be in the 50's and 60's. In addition, his sons, Freddie Jr., (right) and Raphael Munnings (of "Funky Nassau" fame) followed closely in his footsteps musically, both being well-known Bahamian musicians. Fred Munnings, Jr., one of the coordinators of Junkanoo in June and one of the Junkanoo judges for the massive holiday rushouts, was instrumental in the production of a fabulous CD, Dreamer Man, in tribute to his father. The CD is a great mix of cultural/historical music with a distinctive Bahamian flavor. The poignant title tune, Dreamer Man, truly touches the core of one's soul; the cut, Come Back Home, in tribute to the African motherland makes you stop and ponder African diaspora linkages and contributions between bouncing to the stirring rhythms. The CD is made even more unique by the recording and masterful arranging of the Black National Anthem, Lift Every Voice and Sing. One actually learns a bit of history through reading the Dreamer Man cd insert, as it is noted there that James Weldon Johnson and Rosamond Johnson, the African-American brothers who authored this world-renowned anthem, were of Bahamian descent. Do tell! We definitely learn something new every single day, don't we? Truly, one of the nicest experiences of my last Junkanoo journey to Nassau was meeting this noted Junkanoo expert, Fred Munnings, Jr., and obtaining a copy of "Dreamer Man" to enjoy during my own dreaming-of-those-back-in-the-balmy-Bahamas days while back in front of my computer in Brooklyn. It is obvious that he is a sincere proud advocate of Bahamian culture and on carrying to even higher levels the legacy of both his father and the ancestors who established Junkanoo. Above is a graphic of the comfortable, tropically-decored Holiday Inn Junkanoo Beach Hotel. Hey, if you're going to Nassau to enjoy Junkanoo and the heart and soul of Bahamian culture, you might as well make it a topnotch cultural getaway experience by staying at a gorgeous Junkanoo hotel. As a Junkanoo aficionado when I heard they'd name this hotel after that fabulous cultural event, I felt that it would be more than apropos to experience a stay there while on the island to do my Junkanoo interviews and research. Hmm, wise decision indeed. I enjoyed every moment. I've stayed at a variety of facilities throughout Nassau, but the Junkanoo Hotel has now become my supreme favorite. When you enter those colorful rooms with walls graced with vibrant island artwork, you know that your vacation has been blessed with what I call "tasteful tropical splendor". 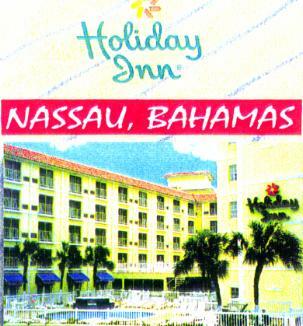 The hotel, conveniently located on West Bay Street, is in the perfect spot, as you are in leisurely walking distance of a number of cultural and historical sites, including the downtown shopping area and Straw market, restaurants, museums, and Arawak Cay (called the "Fish Fry" by Nassauvians), open-air restaurants where fresh Bahamian seafood dishes are sold and ofttimes prepared right before your eyes. On Sunday afternoons, generally beginning in early spring, the Saxons' Junkanoo group holds its Junkanoo practices at the field across from the Fish Fry. You'll not only witness a nice Junka rhythms treat but can actually get right out there and jam with them, if so inclined. 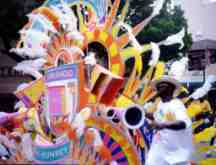 This site, as mentioned above, is also the locale of the Junkanoo in June activities, a must-see range of events and performances for cultural travelers to Nassau. I definitely plan to pack my treasured kente cowbells when I go to Nassau for the Labour Day/Junkanoo in June festivities. As a travel journalist and culture lover, I favor the Junkanoo Hotel, not only for its pristine prettiness, casual comfort, and cultural convenience (seems I'm ever the super-descriptive poet :), but also because the staff is quite courteous and helpful and because the large rooms (all beachfront--delightfully enough) have all of the amenities a travel lover could desire, including queen-sized beds, a room safe, coffeemaker, hair dryer, two-line speaker phone, ac/ceilng fans, cable tv/vcr, fridge, microwave oven, and even and iron and ironing board in the spacious walk-in closets--not to mention the large swimming pool and whirlpool bath downstairs. Hmm, quite a nice range of travel goodies. There is also a fitness center on the premises and a business center offering xeroxing services and a free local fax service for guests. my first thought is booking a Junkanoo Beach Hotel stay.